The image above is my first attempt at using Topaz Labs Simplify plug-in, which enables the photographer to create a painting-like rendition of a photo. Below is the photo before processing it with Simplify. Coming into this year, I wanted to expand my photography by starting to learn and experiment with some new post-processing techniques, one of which was to create the occasional "painting" version of my images. When I finished this particular image, the thought came to me to give my take on a topic that seems to appear regularly in photography circles. Is photography art? Apparently, some believe that a photo is uniquely different from a painting. There are certainly some main differences that come to mind when comparing the two. Time - Photos typically capture a given scene over a very short timeframe, from fractions of a second to several minutes in the case of long exposure. Paintings can take days to months and even years to complete. Imagination - Both mediums require this skill, and, on its surface, painting seems to require more. Photographers do not have to create a scene or subject from scratch like painters do. The painter has a totally blank canvas where he or she must imagine what the final product will look like. There are no constraints, only the painter's imagination. The photographer, on the other hand, has a subject already present to capture, but there are many constraints. They must deal with constantly changing light (after all the word photography's origin is derived from the Greek language that translated means "drawing with light"). Their imagination comes into play in figuring out how best to capture the light on the subject, it's direction, color, and shadows it casts. Their imagination comes into play on how to compose the subject, how the camera will capture the subject, and what can be added or subtracted from the image in post-processing. The painter can create anything they want with no constraints. Want soft light? How about a tree? The painter just paints what he wants in the scene. Equipment - Perhaps the biggest difference is in the equipment. A painter has brushes and paint, and must use those to create the end result. A photographer has a sophisticated piece of equipment that seems to do all of the work. I think this is the main reason that there is a debate on whether photography is an art form. Anyone can take a photo, where not everybody can paint. With the proliferation of camera phones, all you need to do push a button, pick an effect, and there you go. If that is the case, then why doesn't everyone's photos look like Ansel Adams took them? Try this, go onto some photography website like 500px.com and look at some of the work there. There are photos there that make your jaw drop that compare very easily to paintings. I know that the extraordinary ones make me wonder how they were able to create it. I could go on and on, but here is my bottom line. Who cares whether photography is art or not? What people seem to forget is that both forms have the ability to evoke some emotion with the viewer. Both represent something that the photographer or painter personally felt and was compelled to express those feelings for others to see and feel. I know when I view a compelling painting or photo, it feels the same. I don't wonder whether it is art or not, just what it made me feel. I know this is a different type of post for me, and I wasn't intending to write on this subject until I sat down to write it. 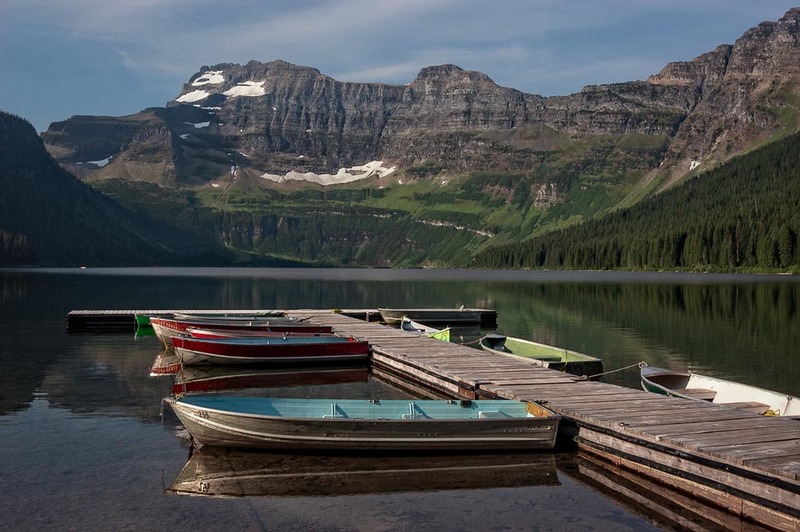 That being said, the photo above was taken in Waterton Lakes National Park in Alberta, Canada. It is of Cameron Lake, which was quite deserted for some reason.